Maeve instructs the patient in the clinical situation with additional graphics showing the technique of breathing and the all-important direction of release of the pelvic floor. This helps with the difficult concept of visualising what exactly is happening inside the body as the brain struggles to feel those small movements..
We learn best through illustration and practical teaching and this is provided in the DVD. 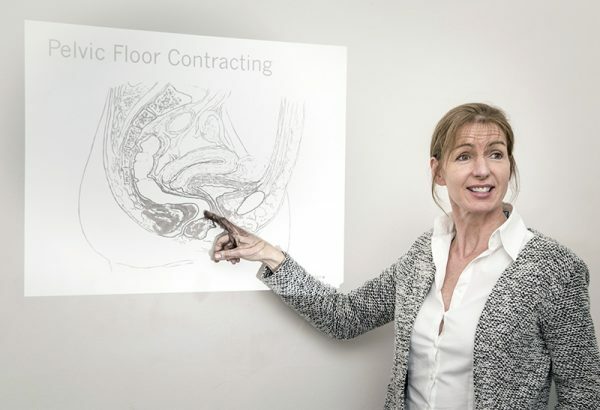 At the end you will have learned the anatomy of the pelvic floor muscles , how to release, how to correctly contract and how to engage the pelvic floor in core body control. In addition there is a section talking through the sequence of a daily exercise programme for practice. I bought your DVD and it has been a great help to me at home. I have been able to work though the sequence of exercises and can really feel the release now where I struggled before. Thanks I feel I have got there much quicker. Hi Maeve, I’ve promised to send an electronic hug and a thanks to you from one of my vulvodynia patients: Well, I say one of “my” patients…..I didn’t do very much at all. A few months ago she couldn’t tolerate an examination so I directed her to your website and DVD and she’s made heaps of progress – can flop and drop in all the right places and is back to happy times with her hubby! As difficult as it is here in the states to find qualified professionals to treat pelvic floor dysfunction (PFD), Europeans have an even worse time. For this reason, I was very excited to stumble across: Pelvic Physiotherapy for Pelvic Pain . I am usually wary of sites that give information on pelvic pain and give instruction on strengthening the pelvic floor. The site is VERY clear about learning to relax completely before jumping into strengthening, and I LOVE the descriptions of the relaxation sequences. Sniff, Flop, Drop. Even I can remember that. Thanks, Maeve Whelan, for coming up with this wonderful resource for women all over the world!